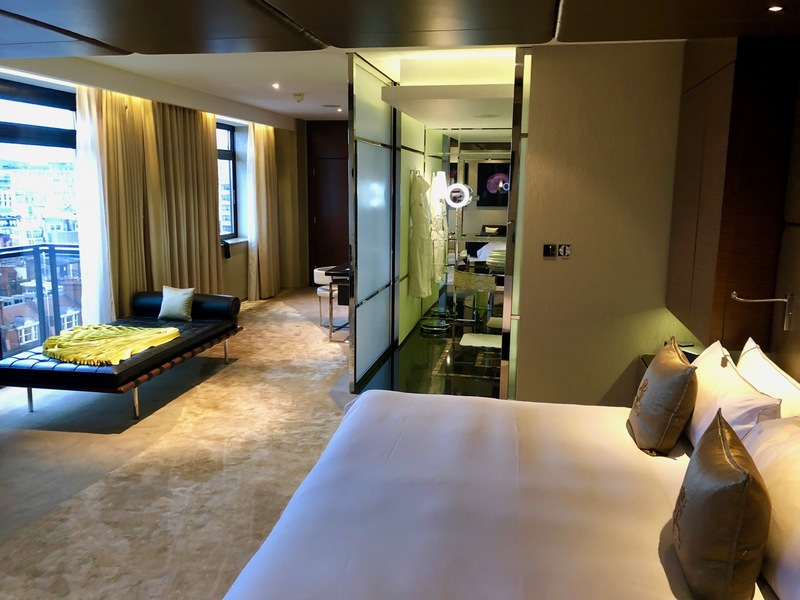 London is a luxury hotel lovers dream with 5 star hotels to suit every taste, from modern and contemporary, to classic chic and over the top opulence. 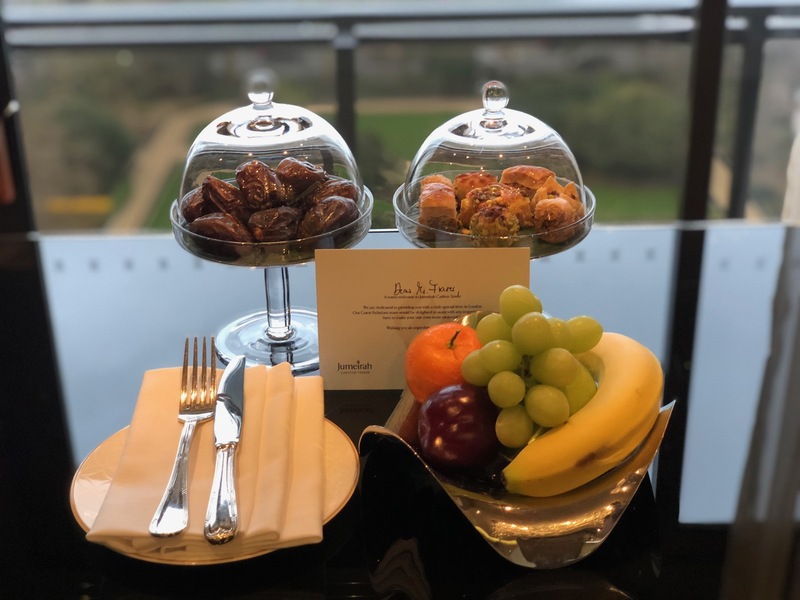 If you are looking for luxury right in the heart of the capital’s shopping district then look no further than the Jumeirah Carlton Tower. 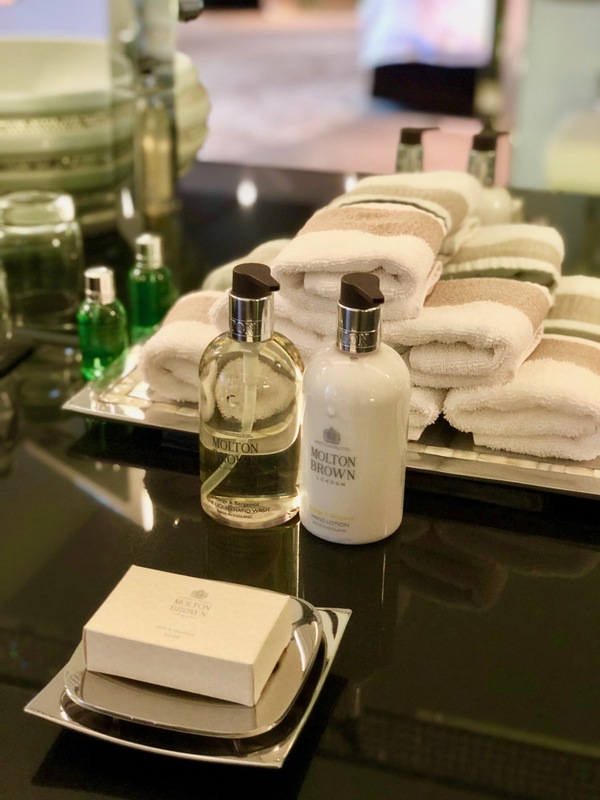 On a recent visit to London we were very kindly invited to stay to experience the best suite in the hotel; the elegant and incredibly indulgent Royal Suite. 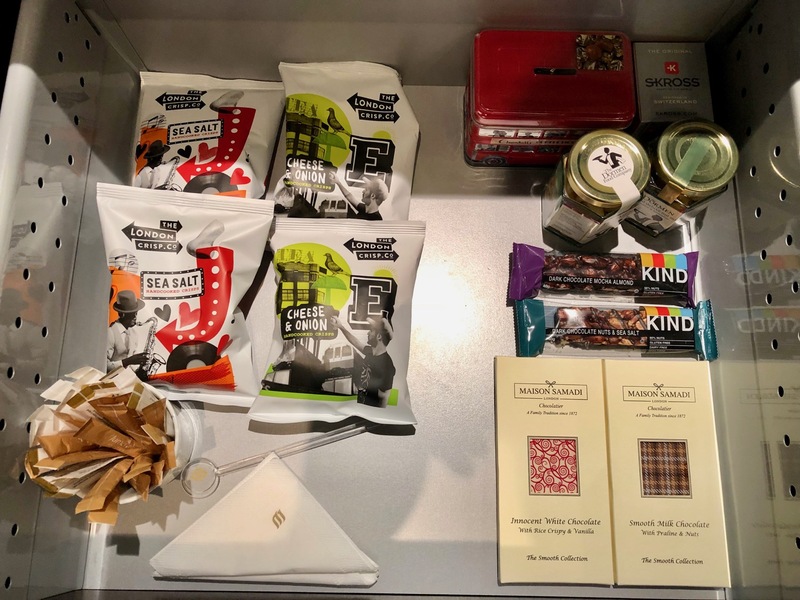 Read on to find out what an overnight, at what has to be one of the capital’s best hotel suites, and certainly one of the best luxury hotels in London is like. 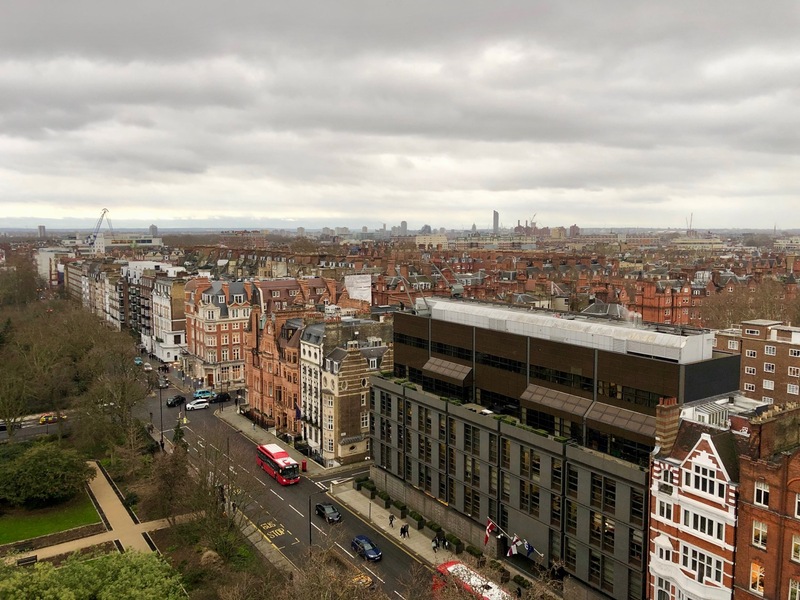 The property has a rich history as a luxury hotel having opened back as the Carlton Tower in 1961 when it was the first modern 5 star hotel in Knightsbridge. Chelsea socialites flocked to the hotel, while fashion designers used it as backdrop to fashion shoots. In 2001 it was bought by Emirati based Jumeirah Hotel Group and rebranded into what it is now known as the Jumeriah Carlton Tower. Today the hotel is slick and glamorous, just like the neighbourhood that it calls home, it’s all about flaunting your wealth here! While the 60’s building exterior doesn’t have the wow factor the traditional buildings in the area have, it more than makes up for it once you are inside, with its 216 gorgeous rooms and suites, extensive health spa, restaurants, bars and communal areas to relax in. 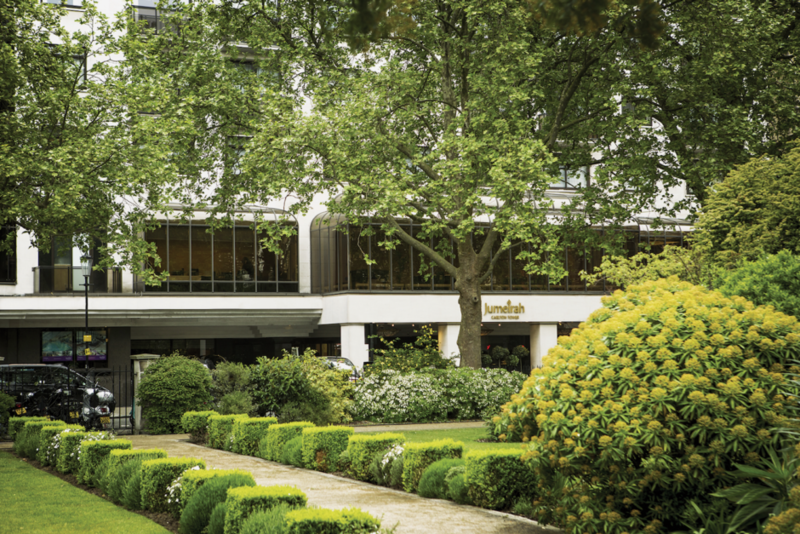 The Jumerhian Carlton Tower has the feeling of a resort hotel rather than business hotel in the centre of London. 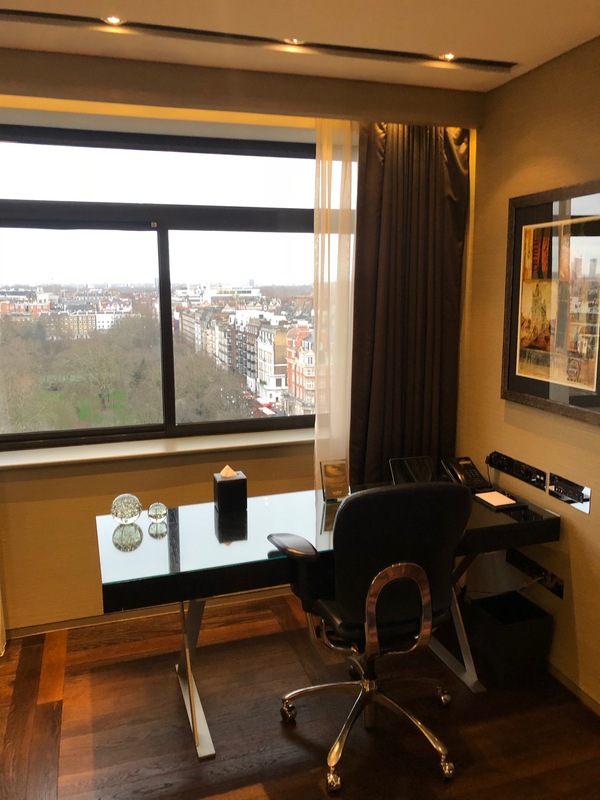 You couldn’t be better positioned than the location of the hotel, right in the heart of London’s finest shopping district. 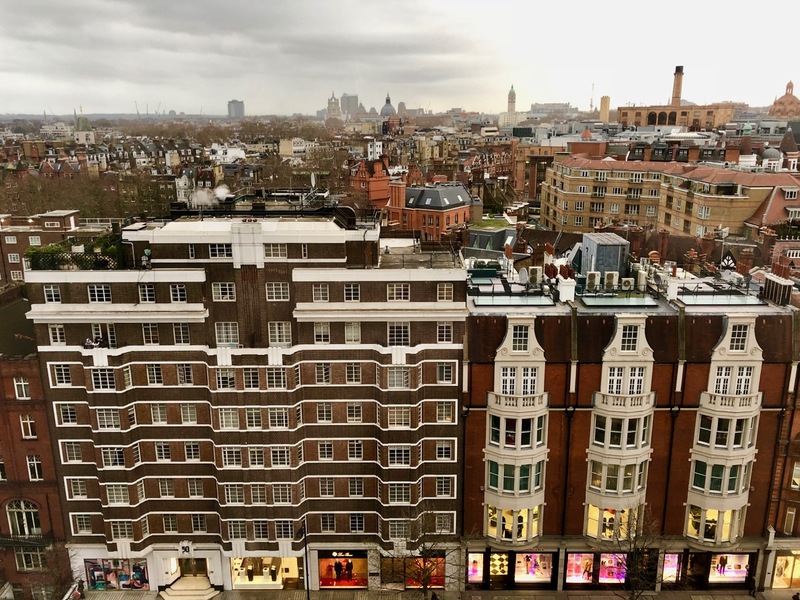 The hotel is located on Cadogan Place just off Sloan Street, which is packed with designer shops. 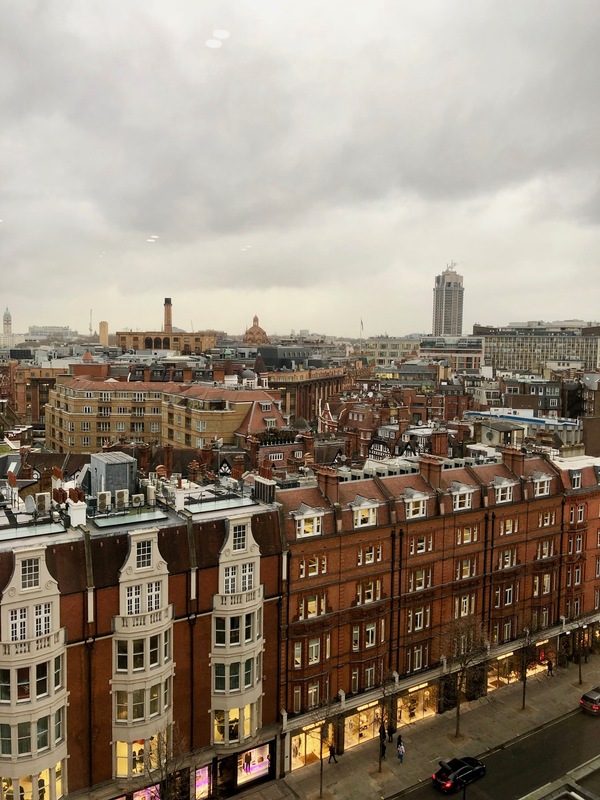 A few minutes walk and you are on Brompton Road ready to explore department stores Harvey Nichols and Harrods and a 15 minute walk in the other direction and you are at Sloan Square. 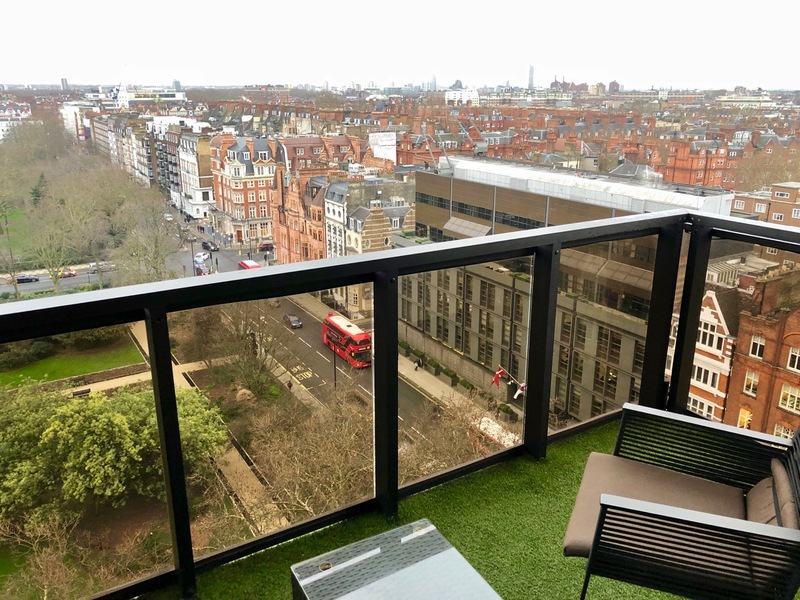 Guests also have exclusive access to Cadogan Place Gardens, the private gardens opposite the hotel which are otherwise only accessible to local residents. 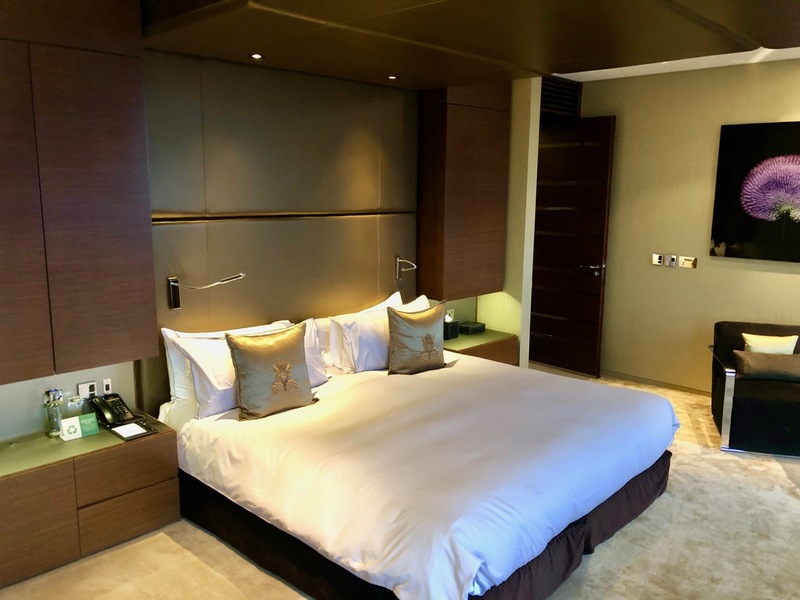 Offering panoramic city views and overlooking leafy gardens, the fresh and contemporary elements of Jumeirah Carlton Tower’s 216 guest rooms and suites combine sophistication with understated luxury. 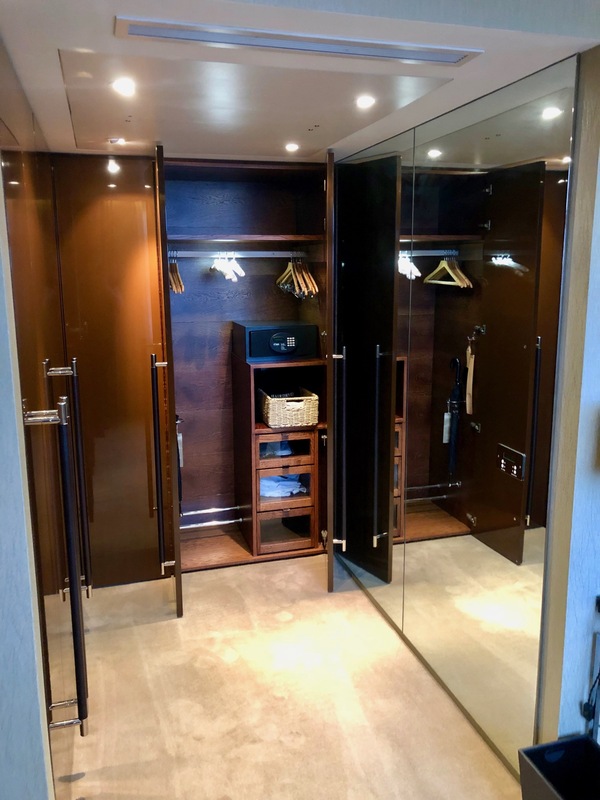 In 2012, the majority of the hotel’s guest rooms underwent extensive refurbishment with design by leading agency Lynne Hunt London. The new rooms utilise modern furniture and state-of-the-art technology to enhance guest comfort. The hotel has 216 rooms of which 58 are suites. 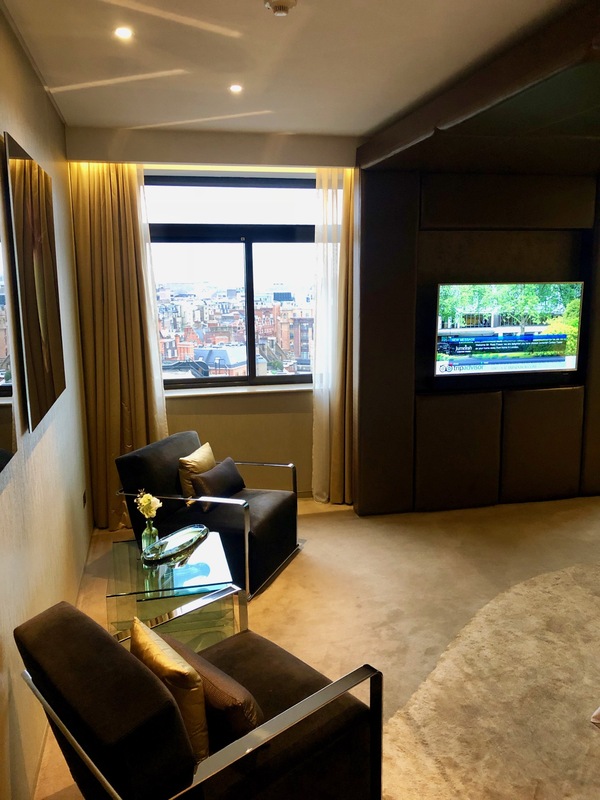 Of the suites guest can choose from four spa suites which offer 34 square meters of luxury and views of Knightsbridge. 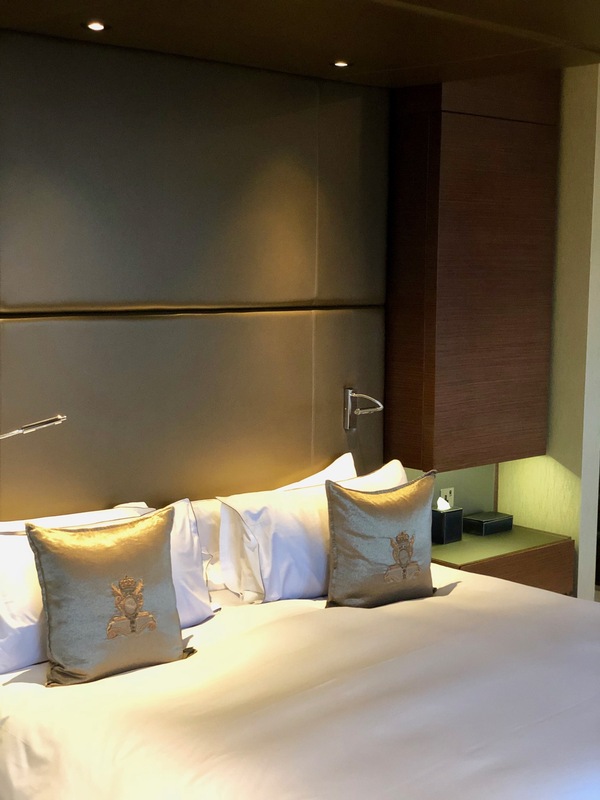 The 23 junior suites are ideal for families or three adults, while the eight garden suites showcase the beautiful gardens across from the hotel and sleep up to three people. 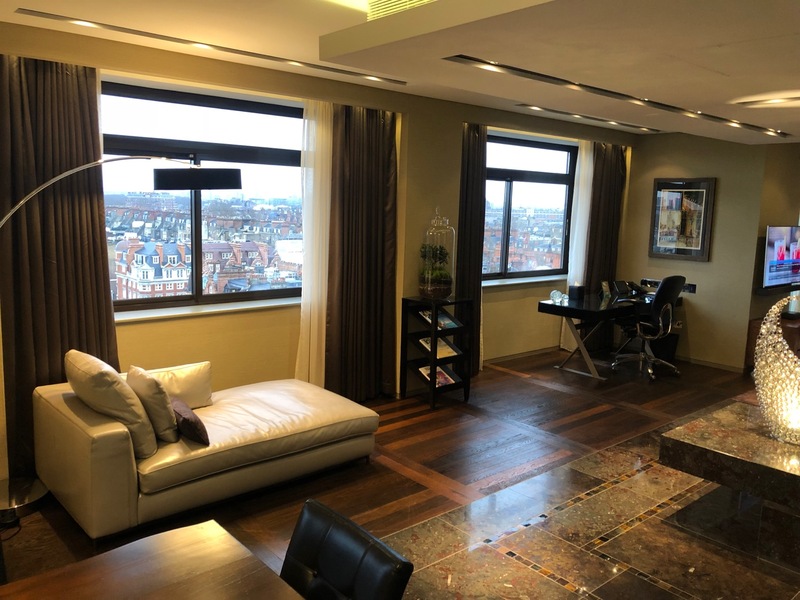 The seven executive suites and eight London City View Suites are elegant and luxurious and if you want all out luxury and space then the Royal Suite is the one to go for! 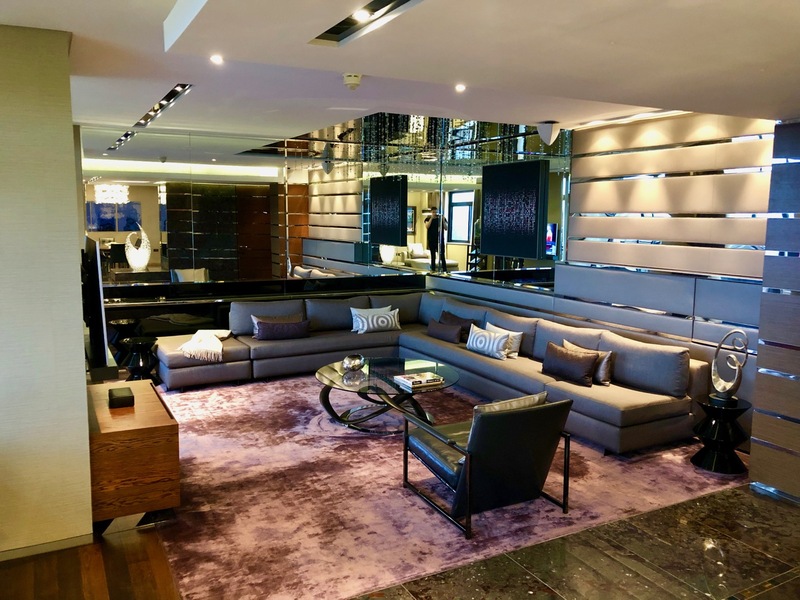 Interiors for the hotel’s Royal Suite were created by International Designer Khuan Chew. 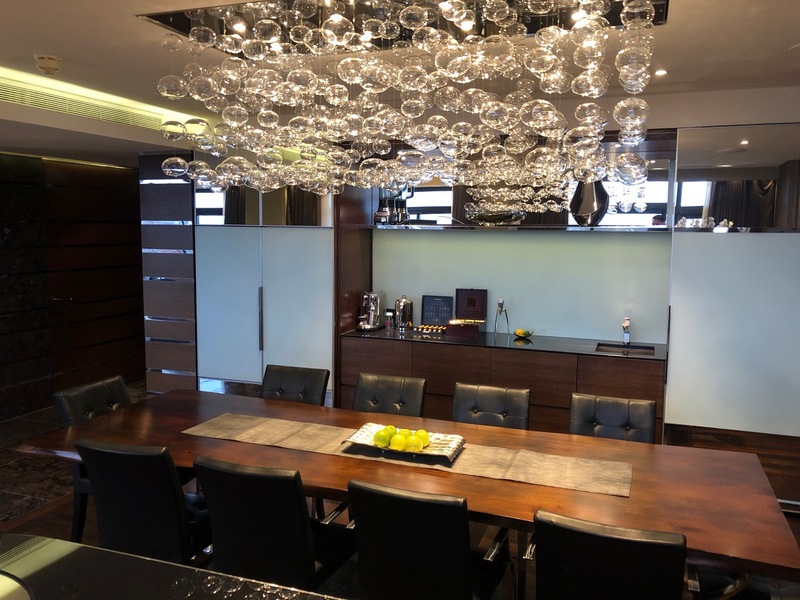 With an impressive client list spanning four continents, the diversity of her work has ranged from exclusive penthouse apartments, country houses, super yachts and royal palaces to international airports and 5 star hotels, including the Burj Al Arab Jumeirah. 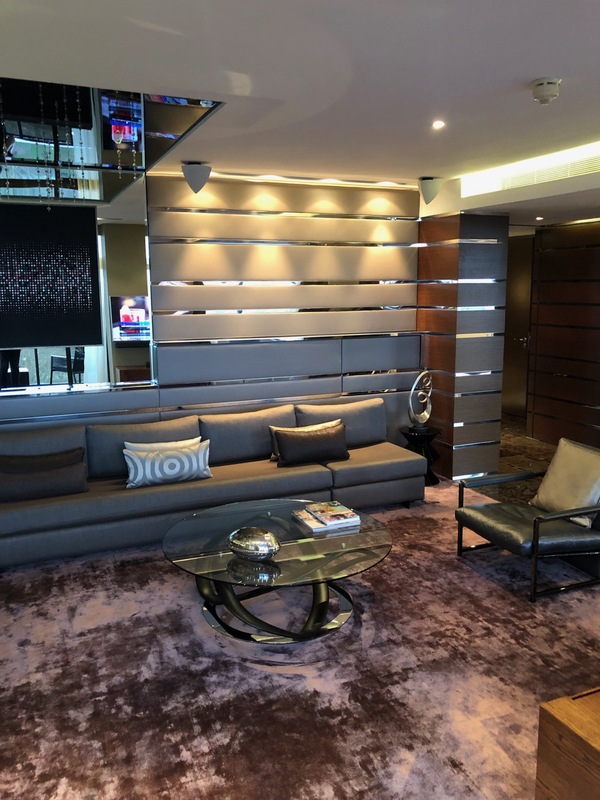 In the Royal Suite at Jumeirah Carlton Tower, Chew has used rich, handcrafted materials, from Italian and French furniture, handmade rugs and carpets through to granite and stone flooring. Styling gives a nod to the avant-garde with a leather canopy in the bedroom and Swarovski crystals on the bathroom ceiling. 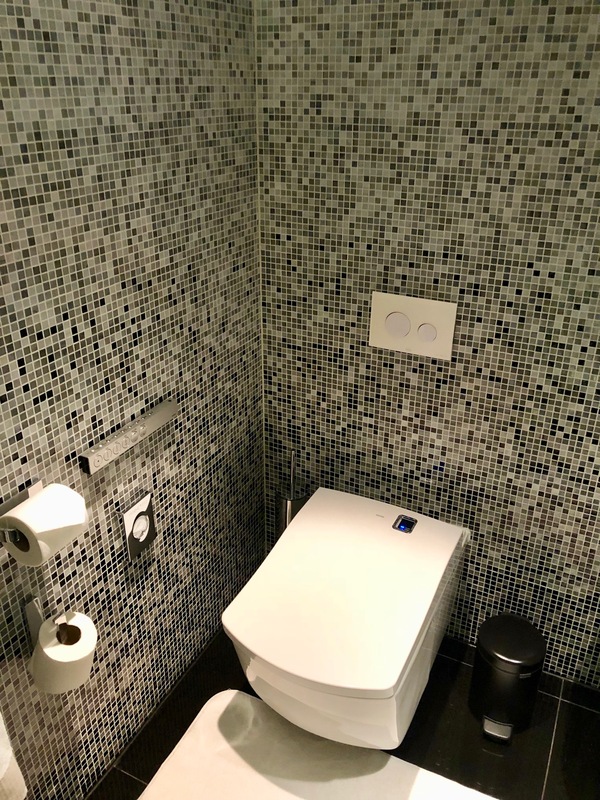 The bathroom also comes complete with wet room, infinity bath with chromatherapy lights and inset TV, walk-in rain shower and flooring inlaid with jasper and marble. 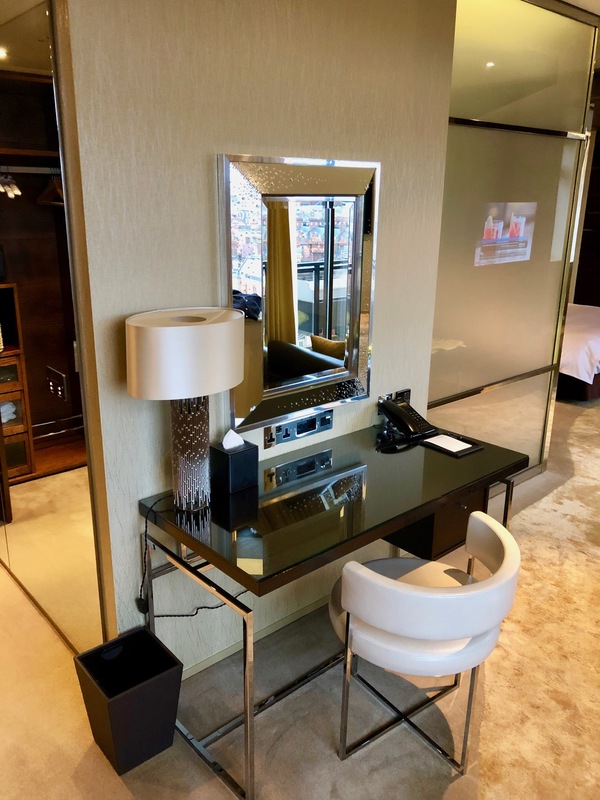 Scroll on to let us take you on a tour of this incredible suite! Enter via a hallway which leads into the lounge and dining room. There is a chaise lounge and work desk which both look out to Cadogan Square. 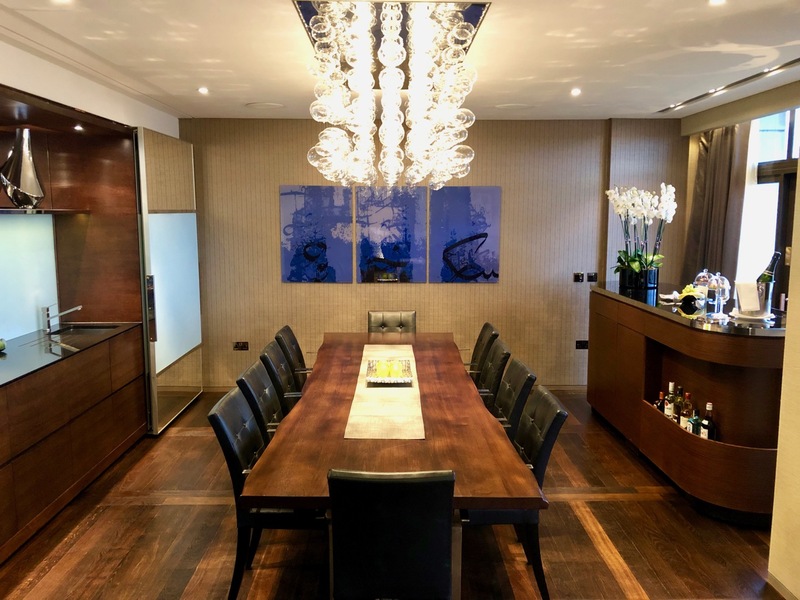 The main lounge area is gigantic and big enough to sit ten people, the mirrors and glossy finish add to the luxurious feel of the space and the Swarovski crystal lights between the dining room and lounge is an incredible focal point in the room. Leading off the lounge you have a balcony which looks out to the square and is perfect for a drink in the evening as you unwind after exploring the city during the day. Adjacent to the lounge is the dining room with a table that will seat ten people. 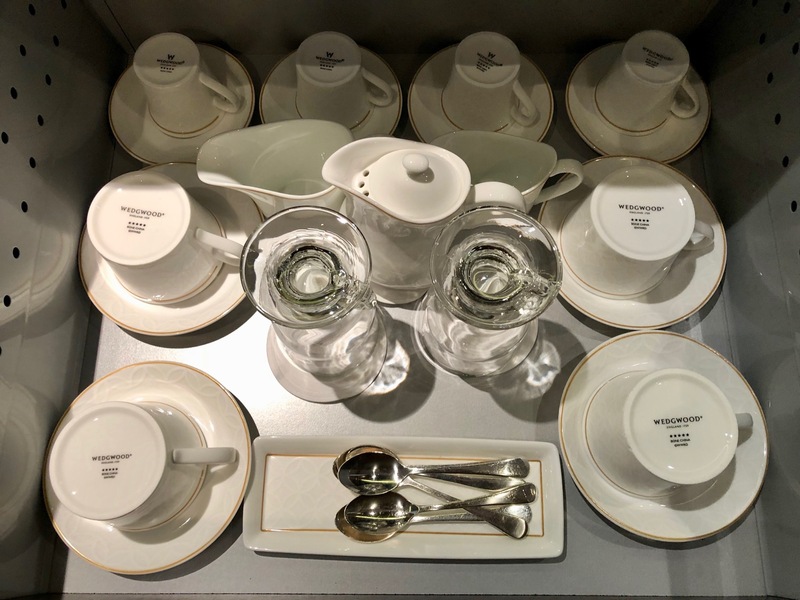 To one side is the built in sideboard which has an array of crockery and glasses as well as full built in fridge, water and ice dispenser and to the other side is the bar where you can mix up a cocktail or get your butler to do it for you. 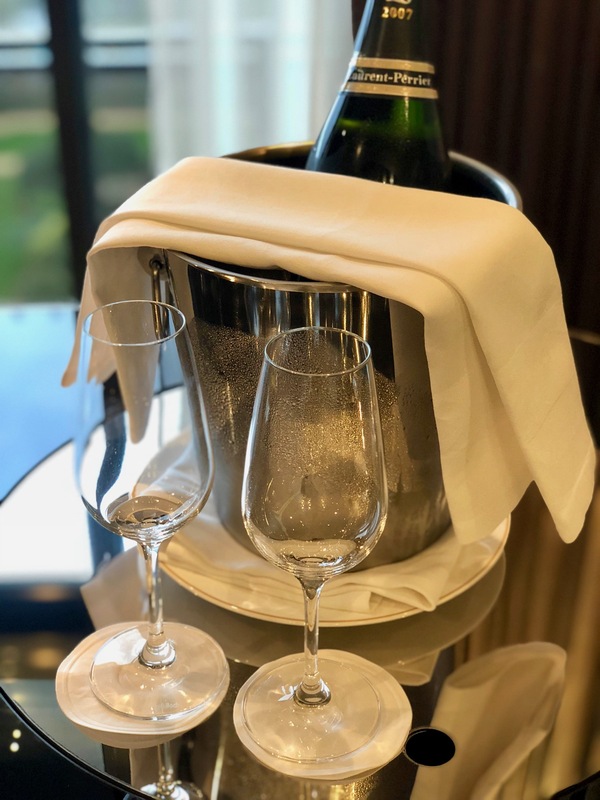 Little finishing touches are all over the suite, like the welcome sweets and champagne waiting on arrival. 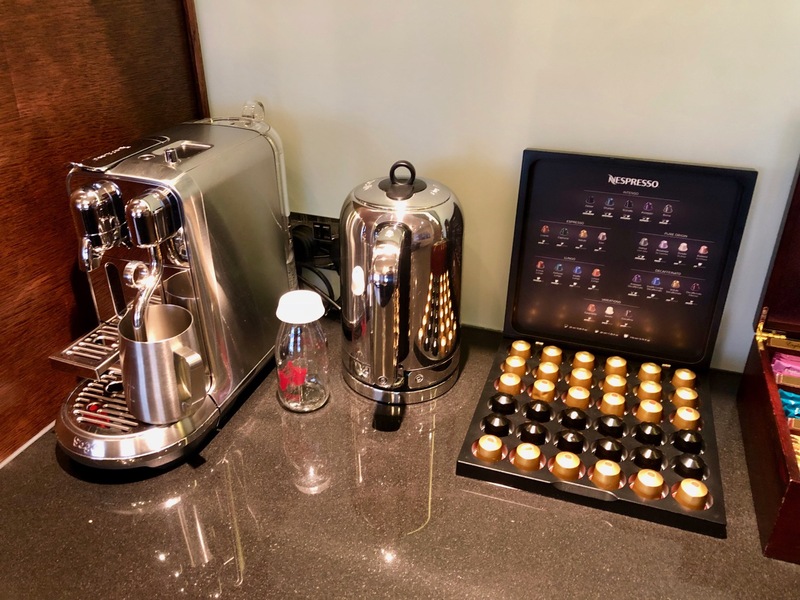 There is a huge array of Nespresso capsules to choose from and just call your butler for milk for your coffee. Walk back into the hallway and make your way into the gorgeous and huge bedroom which looks out to Sloan Street. Curtains close automatically, just the flick of a button and the curtains are drawn. A king sized bed which really is fit for royalty! The bedroom includes a writing bureau and next to it a large triple sided mirrored wardrobe. 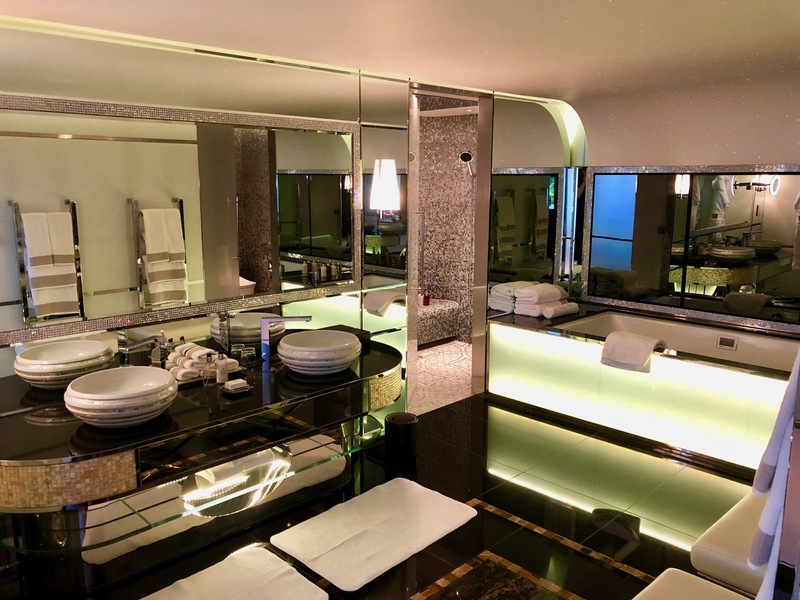 I absolutely loved the bathroom, I could have spent all day in it, leading off the bedroom it is almost as big as some hotel rooms (FYI there is another bathroom just off the lounge and dining room). 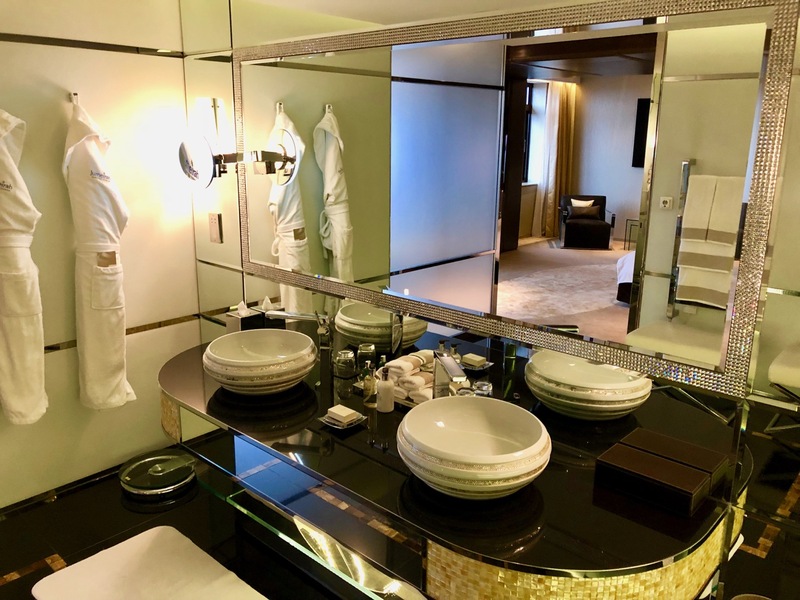 Two sinks and a whole host of amenities and goodies are next to the sinks, the design has a slight nod to the art deco era with the curved edge around the sink area, ceiling and marble floor tiling. 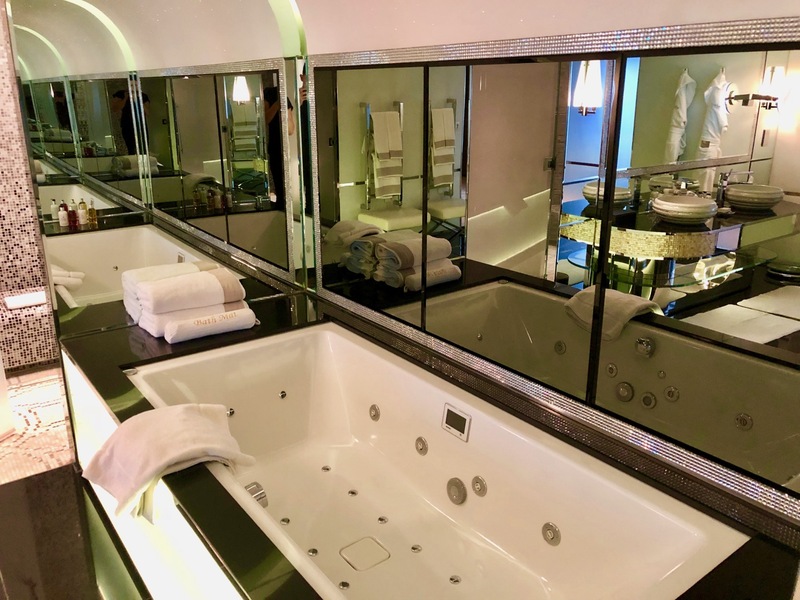 The huge double sided bath can fit two people and also doubles up as a jacuzzi! 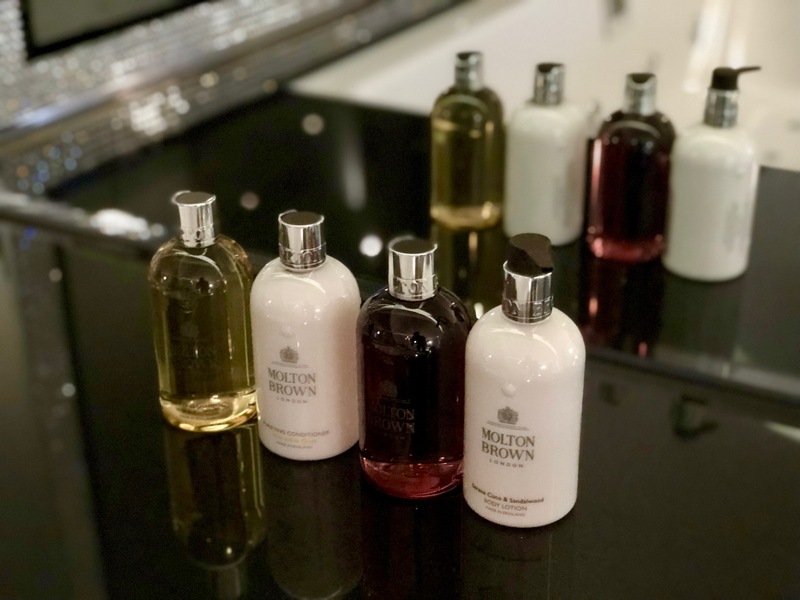 Amenities are by Molton Brown and there were two different shower gels, and I love love love the fact they don’t come in tiny little disposable bottles! 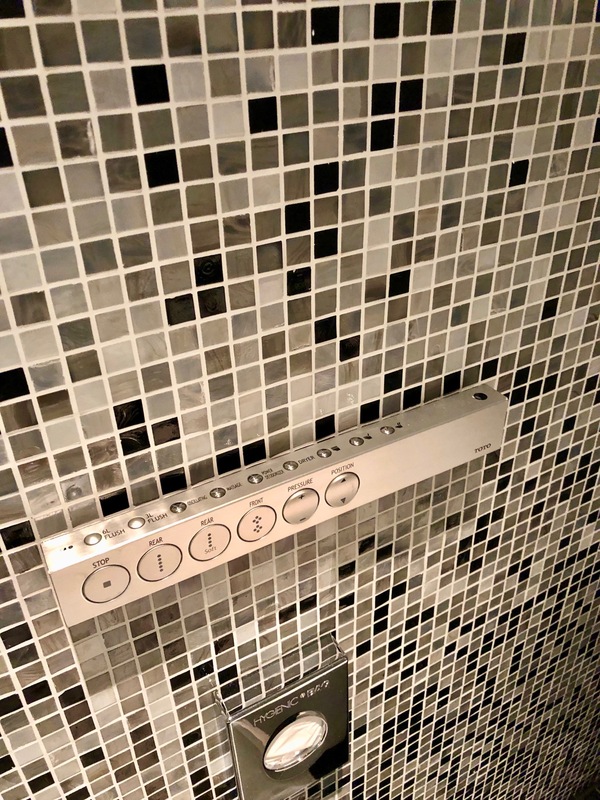 The toilet is a Japanese toilet which comes complete with a remote control which will do everything from heat the seat to wash you, and for the ultimate laziness the lid lifts automatically as you walk into the toilet area. 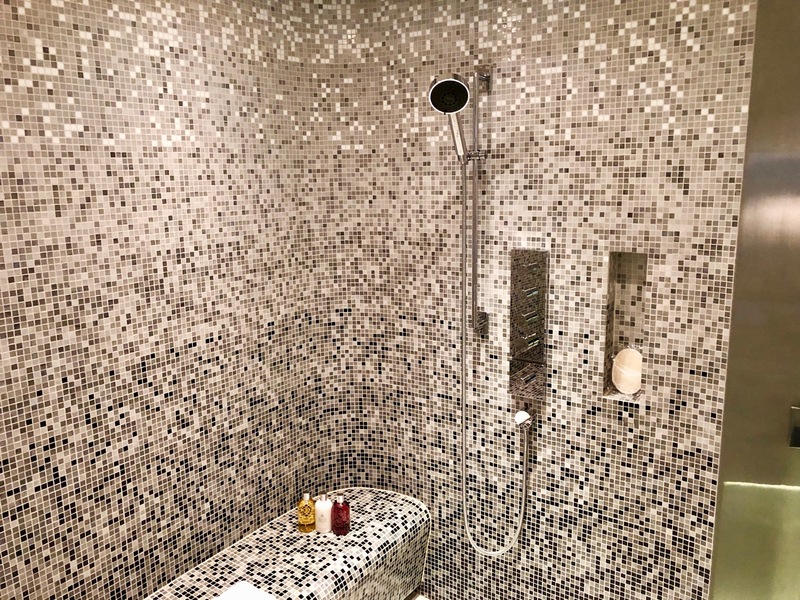 The bathroom also includes a large walk in wet room with huge rain shower for two people as well as paddle shower. 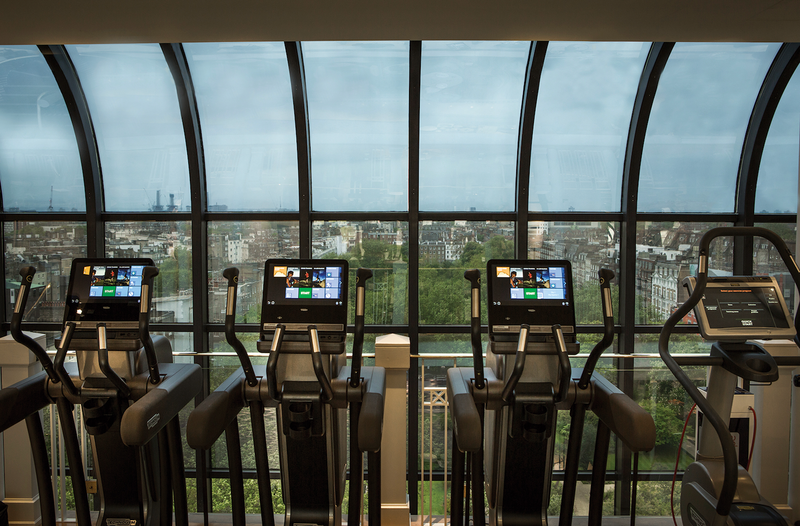 An oasis in the sky with an unrivalled panorama of the capital, The Peak Health Club & Spa is the ultimate urban retreat. Open daily, The Peak boasts a fully equipped gym and two fitness studios offering over 70 classes a week, as well as spa treatment rooms, sauna, steam rooms, Jacuzzi and a 20-metre indoor stainless steel swimming pool. 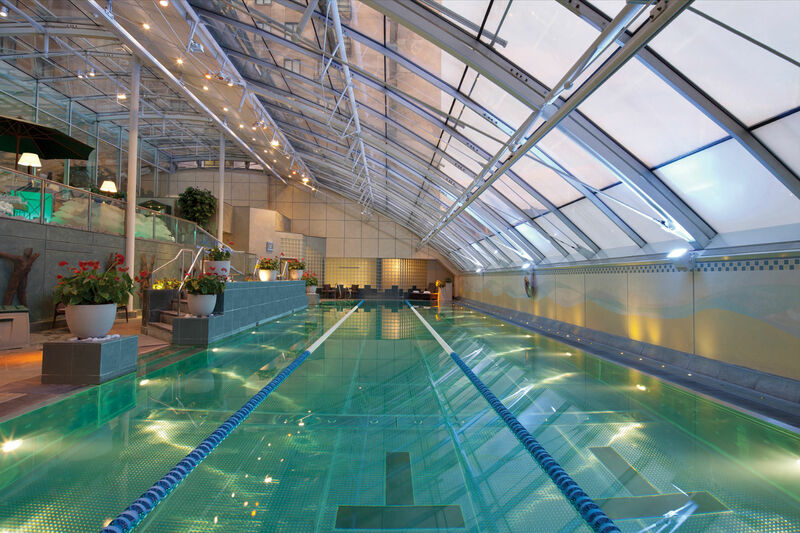 The indoor swimming pool located on the second floor is made from stainless steel and at 20 metres, is one of the longest pools in London’s hotels. An elegant lounge on the ground floor with a sophisticated décor, Chinoiserie is the perfect place to enjoy the UK’s Best Afternoon Tea, light meals and beverages throughout the day, whether meeting a business associate, catching up on emails or relaxing with family and friends. The Chinoiserie lounge serves a traditional and elegant afternoon tea experience daily from 3pm to 6pm with live accompaniment from the hotel’s resident harpist who plays a broad repertoire of music, from Vivaldi to Coldplay. With its comfortable armchairs and sofas, it is also the ideal venue to enjoy the awad-winning afternoon tea whilst being entertained by the resident harpist. The Club Room at The Peak Health Club &amp; Spa, located on the ninth floor, serves a wide range of fresh and healthy meals including an a la carte menu allowing guests to ‘pick their protein’ and accompanying sides; a nutritious lunch buffet; delicious fruit juices and smoothies, as well as champagnes, wines, beers and spirits. It is the ideal place to meet friends for an informal lunch or to unwind after a strenuous work-out. 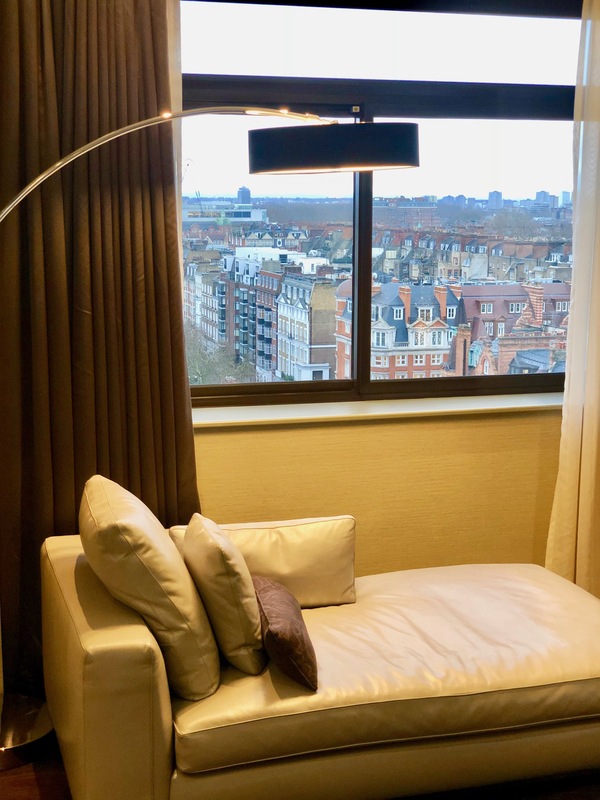 Guests can relax on comfortable sofas whilst enjoying the panoramic views of the city and Cadogan Gardens. Plasma TVs and a selection of newspapers and magazines are provided for guests. The Rib Room Bar & Restaurant is located on the ground floor of Jumeirah Carlton Tower, in the heart of Knightsbridge. Recently awarded two AA Rosettes for culinary and service excellence, the Rib Room is elegant and intimate, blending traditional and contemporary design. 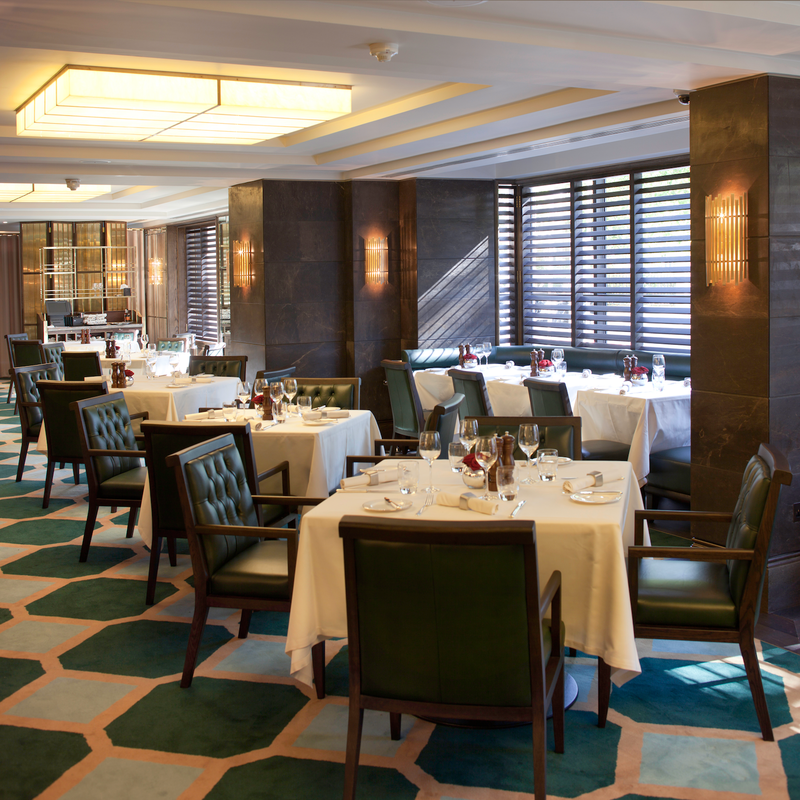 Located on the corner of Sloane Street and the picturesque Cadogan Gardens, The Rib Room serves the best British cuisine with a superb selection of wine and cocktails. 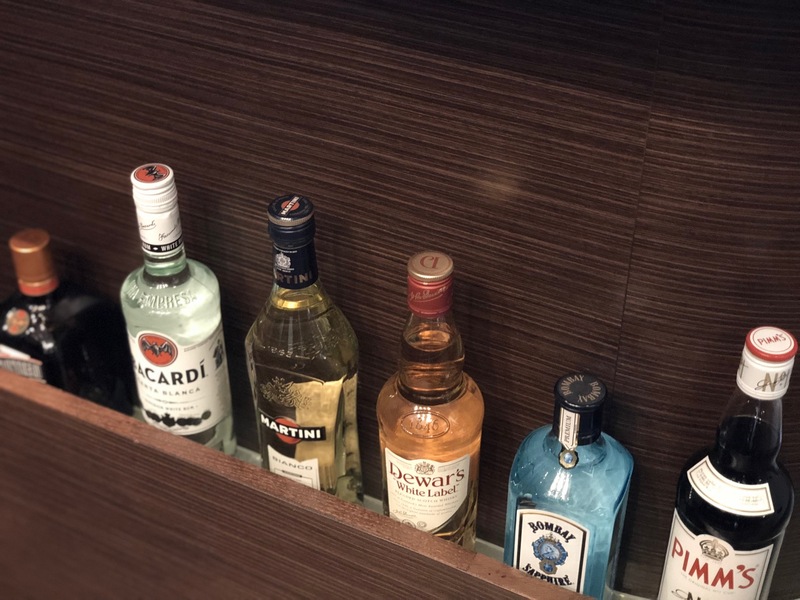 The Rib Room Bar is a glamorous destination for drinks or a light bite, offering an exciting array of cocktails, premium gins and bespoke bitters. 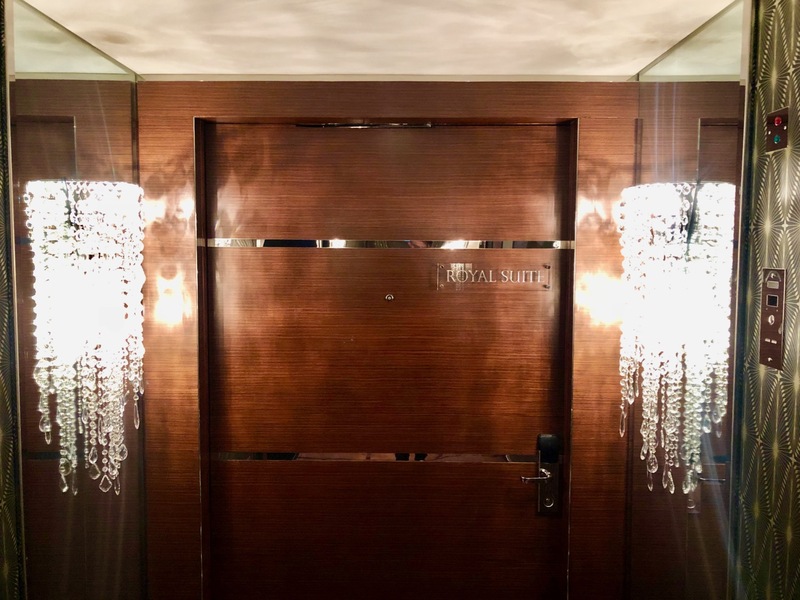 The hotel is incredibly chic, from the moment you arrive and the doorman opens the door for you right up until the second you leave, you are thoroughly looked after. 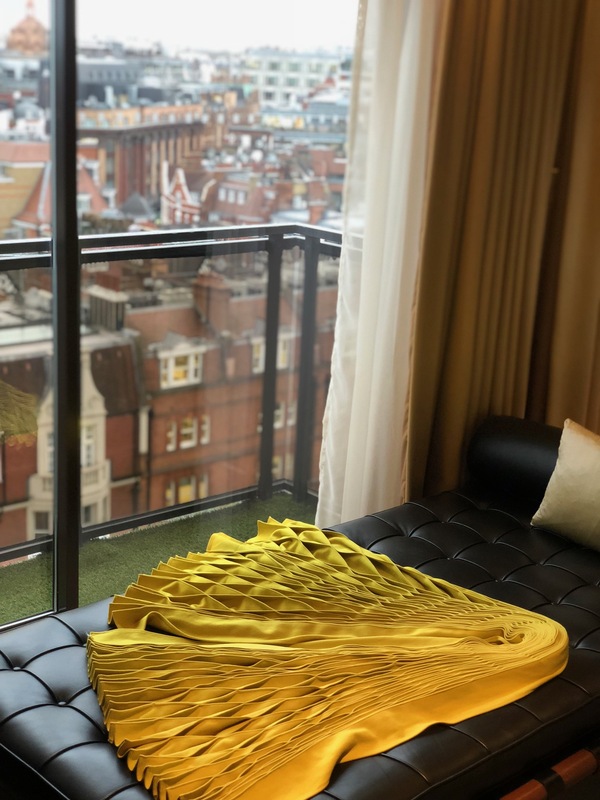 The Jumeirah Carlton Tower offers decadent luxury right in the heart of Knightsbridge and TLE couldn’t have felt more at home. Rooms start at £360 per night and spa suites start from £500 and you can go all out with the Royal Suite which is priced upon request.